Kuching is the city in east Malaysia with the best preserved colonial heritage. 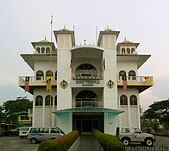 This dates back to the 19th and 20th century, when the white rajah Brooke dynasty ruled over Sarawak from Kuching. Spread on both sides of the Sarawak river are a number of colonial era buildings: the Astana, the former residence of the white rajahs, Fort Margherita, the Square Tower (what remains of an old fort), the Old Court house, the Tua Pek Kong temple and more. In addition, shophouses, the typical colonial era buildings used for living and selling, are plentiful all over central Kuching and in an excellent preservation status.